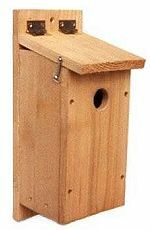 Build this nest box with cedar, pine or most any softwood. Use wood stock rough-cut on both sides so birds can grip interior and exterior surfaces. Make an 8″ by 8″ floor (inside dimensions) and a15″ floor to ceiling height (inside front). Cut a 3″ diameter entrance hole located 12″ above the floor (to top of hole). Drill or cut ventilation openings in the floor and under the roof. 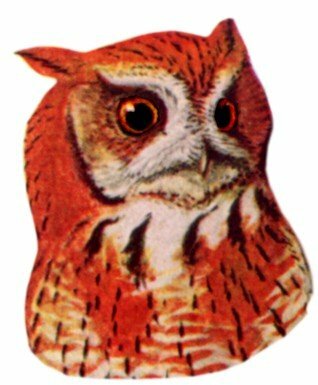 For kestrels and screech owls mount in a tree at the edge of a wooded area or on a post in an open area in a rural or city yard between twelve and twenty feet high. Place some wood chips (not sawdust) on the floor. 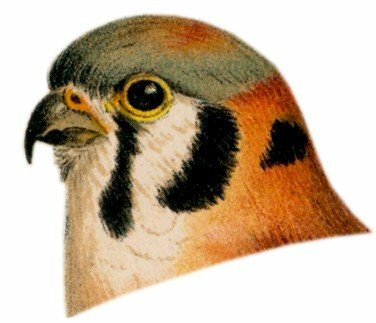 See each bird species page. This installation is at a significant height. Installations out of reach and further should be installed and maintained by professionals with the right equipment and experience: carpenters, electricians, line workers, etc. 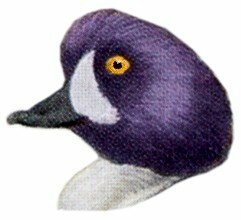 For Barrow’s goldeneyes, attach boxes to metal (preferable) or wood posts, with 3′ wide cone predator guards, 4′ above water (seems to be preferred by ducks), 6′ if above ground, higher if it is likely to attract the curious. If above ground, locate near ponds and where vegetation provides cover for ducklings to travel to water. Place 3″ to 4″ of wood chips (not saw dust) in the boxes. Remove everything from the box and clean well after the brood rearing season is past. Do not mount duck boxes in trees. Nor under or too close to trees where squirrels can leap on to boxes. Predation from snakes in the south, raccoons most everywhere and a number of other mammals and birds is so pervasive that proper placement and predator guards are essential. Make an 8″ by 8″ floor (inside dimensions) and a15″ floor to ceiling height (inside front). Cut a 3″ diameter entrance hole located 12″ above the floor (to top of hole). Drill or cut ventilation openings in the floor and under the roof. Secure a hinged roof in closed position with shutter hooks. Or make a fixed roof and Side Opening Doors. Always use corrosion resistant screws and hardware. Drill countersunk pilot holes in primary work pieces. Drill regular pilot holes in secondary work pieces. This reduces a tendency for wood to split. It also makes for easy assembly in minutes with a power or hand held screwdriver. 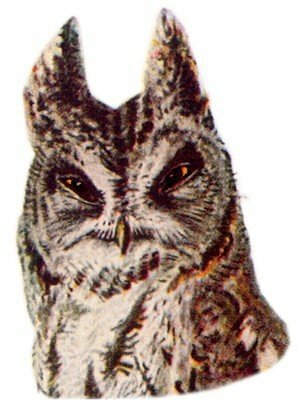 For kestrels and screech owls mount in a tree at the edge of a wooded area or on a post in an open area in a rural or city yard between twelve and twenty feet high. Place some wood chips on the floor. See each bird species page. If above ground, locate near ponds and where vegetation provides cover for ducklings to travel to water. Place 3″ to 4″ of wood chips (not saw dust) in the boxes. Do not mount duck boxes in trees. Nor under or too close to trees where squirrels can leap on to boxes. Predation from snakes in the south, raccoons most everywhere and a number of other mammals and birds is so pervasive that proper placement and predator guards are essential.